Gunfire erupted at a graveside service Wednesday afternoon in a cemetery near Baltimore leaving one man dead and another critically injured, police said. The shooting occurred about 12:43 p.m. at the Mt. Zion Cemetery in Landsdowne, Maryland, police said. The two men shot were both attending the cemetery funeral service, and apparently got into an altercation as they gathered around the casket with other mourners, pulled guns and opened fire, Officer Jennifer Peach, a spokeswoman for the Baltimore County Police Department, said during a news conference near the cemetery. "We believe that they were shooting at each other," Peach said. "One of our jobs is to determine is a victim also a suspect and that will be an avenue that we will pursue." Cars carrying mourners were just arriving at the cemetery for the graveside service for an 18-year-old victim of a shooting when a disturbance broke out followed by gunfire, police officials told ABC affiliate station WMAR-TV in Baltimore. (Google Maps) Mt. 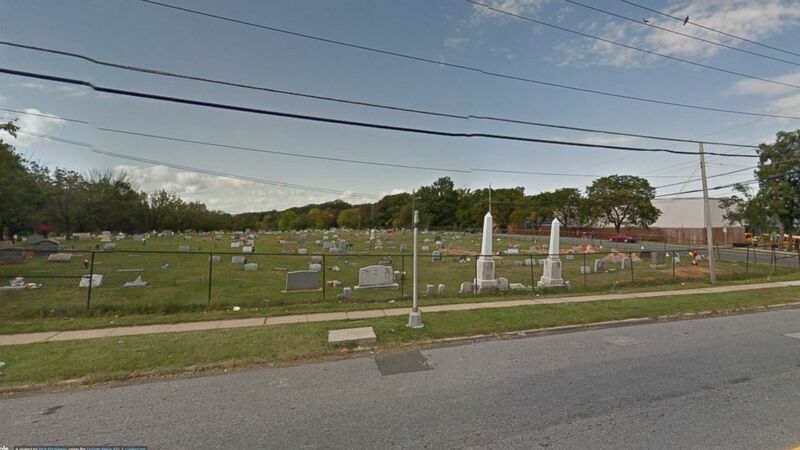 Zion Cemetery in Landsdowne, Maryland is pictured in this Google Maps image. The names of the shooting victims were not immediately released. No arrests were made. "Based on the fact that this was during a funeral, or at the beginning of a funeral, at a cemetery that this was a targeted incident," Peach said. "The information that we have been able to confirm is that a funeral procession had just arrived. Everyone had gotten out of the vehicles and they were surrounding the casket," Peach said. The Baltimore County Police Department released surveillance video from a nearby business showing people who had been attending the graveside ceremony running from the cemetery as the shooting started. Mourners attending the graveside service told reporters the funeral was for 18-year-old Marcus Brown, who was shot to death on Aug. 25 in West Baltimore, according to WMAR-TV.